A new module has been designed to measure TDS within a steam boiler. TDS (Total Dissolved Solids) is the measurement of the amount of solids dissolved in water. The module actually measures conductivity of the water. The more solids that are in the water the more conductive it becomes. A TDS function block has been created to convert the measured conductivity value, as measured by the TDS module in mS, to a temperature compensated TDS value in PPM(parts per million) or mS/cm@25oC. The block also allows a user to set a Probe Factor to cater for the relationship between the conductance measured with the probe and the specific conductance of the fluid. 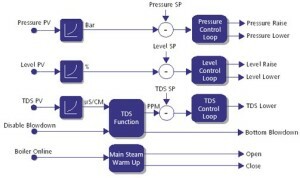 The TDS PV is then wired to a control loop that removes water from the boiler when it exceeds the loop setpoint. This method of control is referred to as Continuous Blowdown. This block has been designed to initiate a Timed Bottom Blowdown to remove the sediment that accumulates at the bottom of the boiler. It is normally carried out at least once per day. The 2704 block can cater for up to three blowdowns per day. Incorporating all the main boiler control elements, the 2704BC provides a very cost effective control solution for packaged Fire- Tube Boilers. The 2704BC can be used solely to control Total Dissolved Solids (TDS), or also to control Water Level and Boiler Pressure. It’s specialist TDS input module is compatible with standard TDS conductive probes, making both retrofit and new installations easy to accomplish. Additionally, Timed Bottom Blowdown and Main Steam Warm Up make use of the controller’s internal real time clock and are included as standard features. For standard applications, controllers are shipped pre-configured to the users specification, using a simple to complete order code. 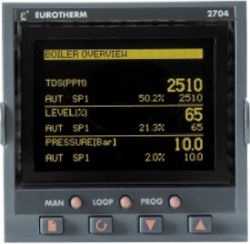 User customisation can be achieved by reconfiguring the controller via its front panel interface or Eurotherm’s itools configuration software. The 2704BC is fully compatible with the standard 2704 process controller which is capable of up to three PID control loops; data sheet number HA026669.